When EOS9CAT prepared the EOS nodes before the EOS main net launch day, we noticed that the EOS node probably could be separated into different roles not only on the main net but also in the on-premise infrastructure. From the EOS main net perspective, the role of the node is divided into “Producing Node” and “Non-Producing Node”. Do a simple search, below is the definition of the Non-Producing Nodefrom the EOSIO Wiki Page – Glossary. A full node running nodeos that is only watching and verifying for itself each block, and maintaining its own local full copy of the blockchain. A non-producing node that is in the “standby pool” can, through the process of being voted in, become a producing node. A producing node, if voted out, will become a non-producing node. Most non-producing nodes are not in the “standby pool”. So the Producing Node is the opposite of the Non-Producing Node. The Producing Node definitely is voted in and producing the blocks. However, it doesn’t mean the Non-Producing Node is not capable of producing the blocks. It means that the Non-Producing Node is a full node and is capable of doing so on demand. Whenever the chain needs to replace an existing Block Producer with a new one, the new one is drawn from the standby pool. As you may notice that we have another terminology – full node. What does “full node” mean? Obviously, it means the node has the full functionality. Then what is the “full functionality”? This is what we are going to talk about today. EOS9CAT has run the nodes on the main net and the jungle net (testing environment) since Day One. With the block logs file is growing bigger and bigger and more and more transactions are signed into the blocks, maintaining all the nodes as the full node isn’t a good idea. A huge amount of P2P synchronization traffic and API visit traffic together will cause the nodes corrupted unexpectedly and make the node to take lots of time to re-sync or replay. Each functionality is implemented by a bunch of the plugins. Thus, let’s go back to the first paragraph of the article. From the on-promise perspective, what EOS9CAT is doing now is playing a full node with several different minor nodes. Networking Node is available to both external and internal. 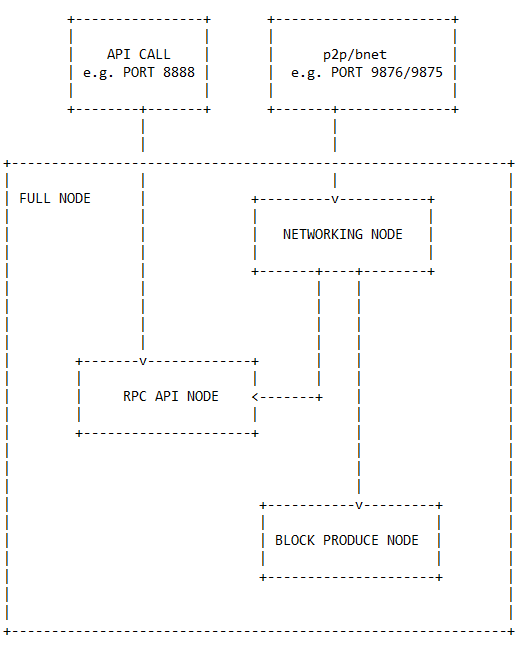 RPC API Node and Block Produce Node only need to connect to the Networking Node internally, NOT necessarily to expose the p2p/bnet port externally. Moreover, each role of the node could be a cluster or replicas which is able to help the node runner to achieve the maximal high availability. Since EOS Release v1.1.0, we could start using the mongo_db_plugin, although the documentation about it is not much. The MongoDB Plugin (eosio::mongo_db_plugin) is an optional plugin that provides archiving of blockchain data into a MongoDB. This creates a read-only copy of the data in the blockchain that enables highly-scalable and convenient queries on that data. After first glance, we are so excited that it’s really a good plugin to use and will improve the EOS node to be more reliable. So EOS9CAT will do some testing with this plugin and keep you posted. Please stay tuned and see you in the next article.